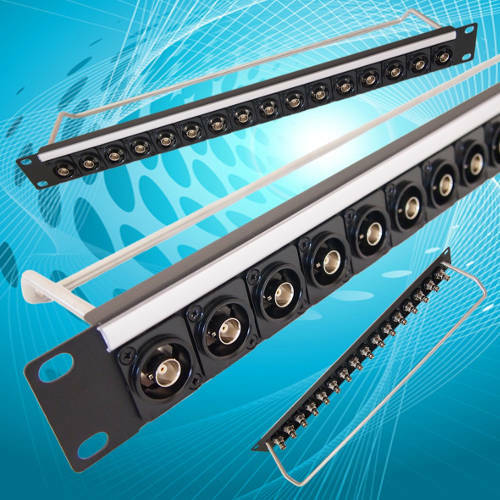 The panels have 16 x 24mm holes to accept the XLR-format feedthrough connectors with options of threaded M3x0.50 or #4-40 UNC mounting bushes. A connector labelling strip is located on the front and a cable strain-relief bar is fitted at the rear. Applications include broadcast and AV patch panels, MIL, medical, control and instrumentation signal input/output panels etc. 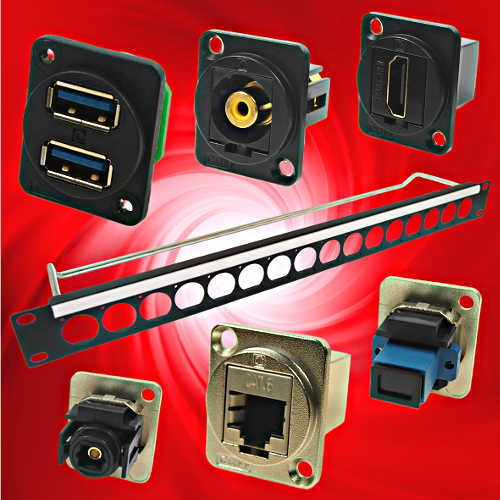 The 1U assemblies can be factory loaded with the specific connectors required by the system designer including BNC, single or dual USB or RJ45 with internal cable harnesses available as a special order. These pre-assembled panels simplify system assembly, reduce manufacturing time, component count and cost. The feedthrough connector range allows designers to integrate audio, video, digital, optical, networking and data feeds into professional equipment for broadcast, lighting, audio, and industrial applications. Versions of note include RJ45, HDMI, BNC and USB3.0 (single and dual). The existing range provides analogue, digital and optical feedthrough connectivity in formats including Firewire, HDMI A-to-A and 50 ohm BNC versions, USB2 A-to-B and B-to-A changer sockets and USB3 to USB3 in various configurations. Also available are popular data and ethernet connectors including LC and SC fibrefiber, (Duplex and Simplex), UTP and FTP RJ45s in both Cat6 and Cat5e, (shielded and unshielded), TOSLINK and RCA phono.phono/cinch. 1U 19″ Panels (opens in a new window). 1U panel suitable for XLR-sized-connectors. 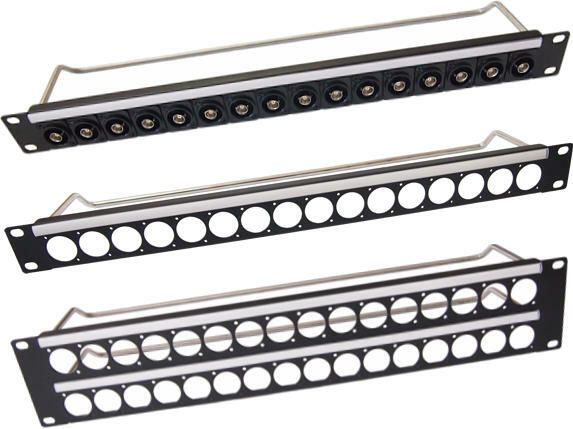 Rack mounting panel with 16 holes of 24mm diameter and various mounting options. Supplied with a cable strain-relief bar and paper identification strip. Black finish. CP30150 1U panel with plain holes. CP30151 1U panel with M3 holes. CP30152 1U panel with #4-40 UNC holes. 1U panel loaded with 16 x 50Ω insulated BNC feedthrough connectors. Rack mounting panel supplied with a cable strain-relief bar and paper identification strip. Black finish. CP30184 1U panel loaded with 16 x 50Ω insulated BNC connectors. M3 holes. Front mounted. 1U panel loaded with 16 x 75Ω insulated BNC feedthrough connectors. CP30170 1U panel loaded with 16 x 75Ω insulated BNC connectors. M3 holes. Front mounted. CP30171 1U panel loaded with 16 x 75Ω insulated BNC connectors. #4-40 UNC holes. Front mounted. 1U panel loaded with 16 x 75Ω gold insulated BNC feedthrough connectors. CP30186 1U panel loaded with 16 x 75Ω 12GHz gold insulated BNC connectors. M3 holes. Front mounted. 1U panel loaded with 16 x CAT6 RJ45 feedthrough connectors. CP30172 1U panel loaded with 16 x CAT6 RJ45 connectors. #4-40 UNC holes. Front mounted. CP30173 1U panel loaded with 16 x CAT6 RJ45 connectors. M3 holes. Front mounted. 1U panel loaded with 16 x CAT6A RJ45 feedthrough connectors. CP30177 1U panel loaded with 16 x CAT6A RJ45 connectors. M3 holes. Front mounted. 1U panel loaded with 16 x HDMI A to HDMI A feedthrough connectors. CP30174 1U panel loaded with 16 x HDMI A to HDMI A connectors. M3 holes. Front mounted. 1U panel loaded with 16 x USB2 A to USB2 B feedthrough connectors. CP30175 1U panel loaded with 16 x USB2 A to USB2 B connectors. M3 holes. Front mounted. 1U panel loaded with 16 x USB2 B to USB2 A feedthrough connectors. CP30176 1U panel loaded with 16 x USB2 B to USB2 A connectors. M3 holes. Front mounted. 1U panel loaded with 16 x ST / BFOC optical fibre fiber feedthrough connectors. CP30178 1U panel loaded with 16 x ST optical fibre fiber connectors. M3 holes. Front mounted. 1U panel loaded with 16 x LC duplex SM optical fibre fiber feedthrough connectors. CP30179 1U panel loaded with 16 x LC duplex SM optical fibre fiber connectors. M3 holes. Front mounted. 1U panel loaded with 16 x LC duplex MM optical fibre fiber feedthrough connectors. CP30180 1U panel loaded with 16 x LC duplex MM optical fibre fiber connectors. M3 holes. Front mounted. 1U panel loaded with 16 x XLR 3DCM feedthrough connectors. CP30181 1U panel loaded with 16 x XLR 3DCM connectors. M3 holes. Front mounted. 1U panel loaded with 16 x XLR 3DCF feedthrough connectors. CP30182 1U panel loaded with 16 x XLR 3DCF connectors. M3 holes. Front mounted. 1U panel loaded with 8 x XLR 3DCF and 8 x XLR 3DCM feedthrough connectors. CP30183 1U panel loaded with 8 x XLR 3DCF and 8 x XLR 3DCM connectors. M3 holes. Front mounted.